We develop, edit, and publish all of our own works. This allows us to meet the highest standards of situational content and editorial quality in the finished product. 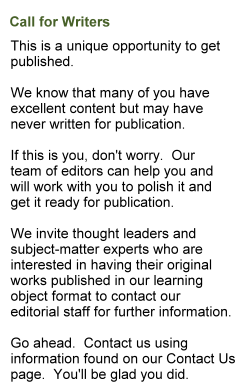 All of our works are fresh and new and have not previously been published. This is not the same old stuff just repackaged. Our current rate of publication is approximately ten to twelve new works per quarter. As these works become available they will automatically be placed in the library giving you and your organization access to a constant flow of new and relevant materials without any increase in access fees. Build a powerful knowledge organization. Use the customizable resources to fit your unique situation.